Mash the chickpeas and oil together until no whole chickpeas remain. Add remaining ingredients and knead for 3 minutes until strings of gluten have formed. Pre-heat large non-stick skillet over medium heat. Divide dough into four equal pieces. Flatten each piece and stretch to roughly 4" x 6". To pan-fry, add a thin layer of olive oil to the pan. 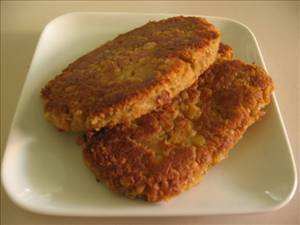 Place cutlets in the pan and cook on each side for 6 to 7 minute They are ready when lightly brown and firm to the touch. To bake, pre-heat oven to 375 °F (190 °C), and lightly oil baking sheet. Brush both sides of each patty with olive oil, place on baking sheet, and bake for 20 minutes. Flip patties and bake another 8 to 10 minutes until firm and golden brown. 144 members have added this recipe to their cookbook. Can you make this without the wheat gluten? What does it do to it if I ommitted it all together?? Suggestions??? I double this recipe and only use1 tbs of oil for the whole thing-- only using 1/4 of what's called for. I also use panko breadcrumbs as they're the only ones I can find that are vegan but they're also lower calorie than regular breadcrumbs. Mine come out to be about 170 calories a piece. These are my favorite veg protein-- so good. This recipe from VEGANOMICON is so tasty. One of my favorites. i made this today, so yummy! Healthy and delicious (and simple) spinach quiche. A healthy no dairy vegan quiche with vegetables and tofu. A quick, healthy mixed vegetable and Asian sauce dish. There are 298 calories in 1 serving of Chickpea Cutlets. Calorie break-down: 26% fat, 38% carbs, 36% protein.